“I WANTED SOMETHING magical,” says Connie Rodriguez of her determination to transform her back garden into something special. 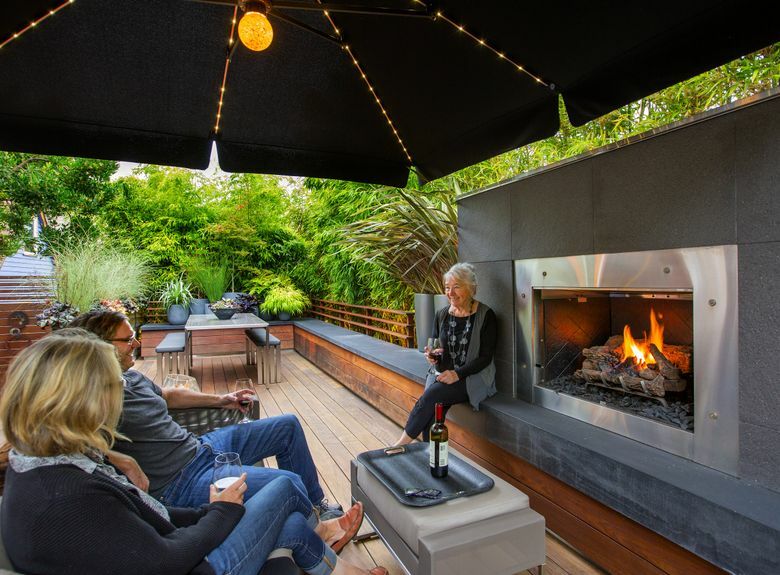 So she hired landscape architect Scot Eckley to renovate the narrow area behind her 1930s home in the North Beach neighborhood. It turns out that Rodriguez, who had worked with Eckley on an earlier redo of her front garden, had more precise requirements than just “magical.” She asked for a relatively maintenance-free space. She loves containers but didn’t want the chore of replacing plants through the seasons. 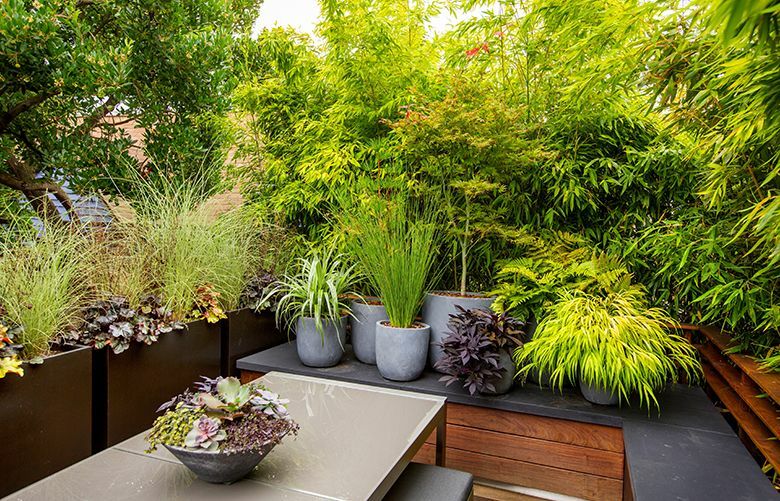 She hoped not only for a functional, multiseasonal outdoor room, but also to turn the “narrow dead spaces” on each side of the house into part of the garden. 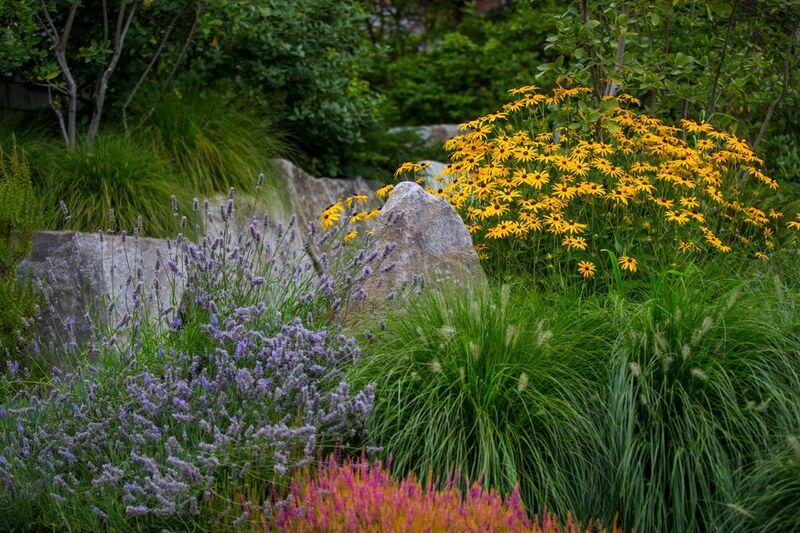 And while the front garden is ruggedly naturalistic, with big boulders and sweeps of ornamental grasses, heather, lavender and black-eyed Susan, Rodriguez wanted a simple and sophisticated feel for the new back garden. And she wanted a space that would pretty much care for itself when she was traveling. The bones were there already in the form of a fireplace and an ipe wood deck that spanned the space between the house and back fence line. 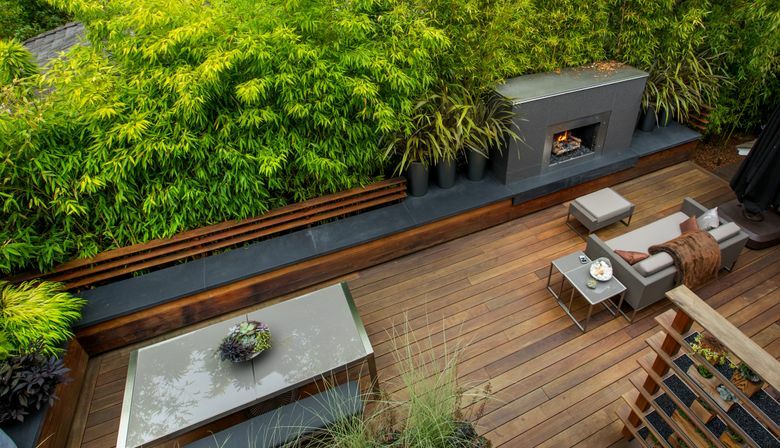 Eckley added night lighting, lots of pots and contained bamboo to plump out the already-existing privacy screen. Now a vast umbrella on rollers and a red Japanese maple in a huge pot shelter the sitting-room end of the deck, lending scale to the cushioned couch and chairs gathered around the gas fireplace. 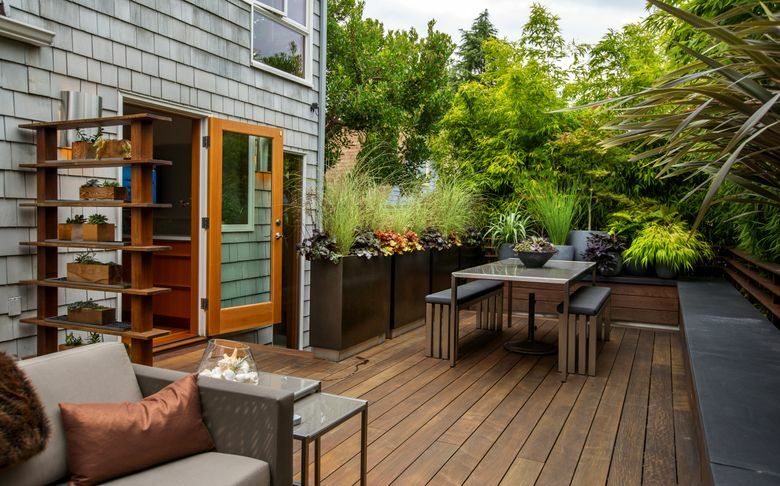 The sleek horizontal lines of the deck define the space, and are echoed in the shape of the steel planters, the slatted bench back, and the rectangular dining table and fireplace. This simplicity of form and repetition lends a calm, restorative feel to the space. Eckley followed up with the lovely detail of capping the benches with heated concrete to soothe Rodriguez’s arthritis. After the garden was completed, Rodriguez recuperated from an illness out on her deck, resting in the warmth of the fire, beneath the leafy shade of the maple tree and shelter of the umbrella. 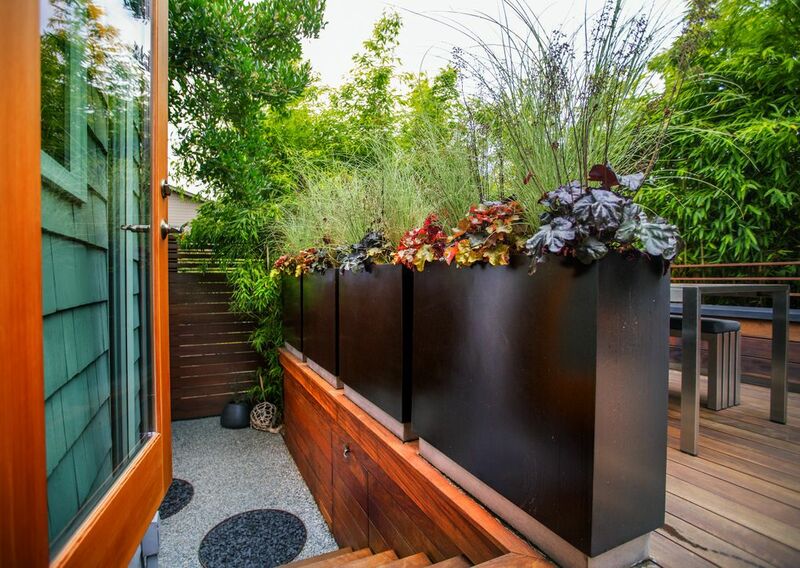 “Everything we do in such a small garden has to count twice,” says Eckley, pointing out how the planters along the stairs are raised on a steel base so they can double as a handrail. The screen Eckley designed to separate the barbecue space from the rest of the deck holds trays and boxes of little succulents and herbs at the perfect height for Rodriguez to tend on the rare occasion they need watering or trimming. 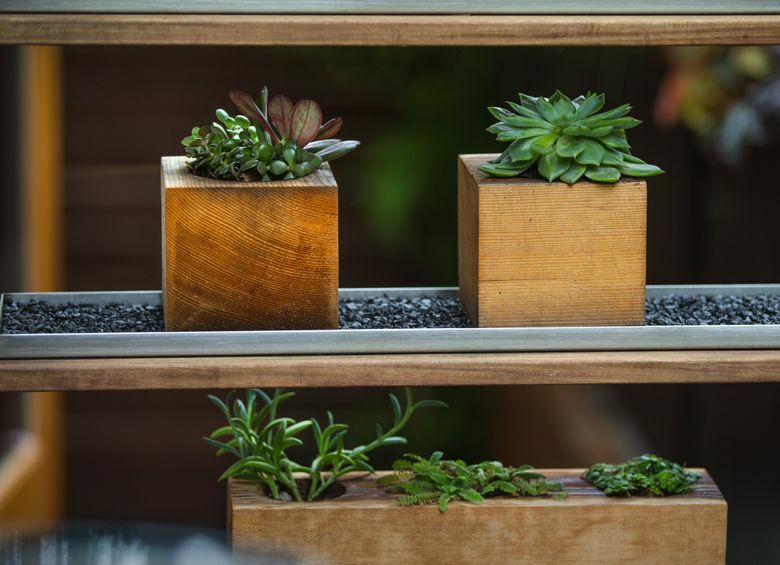 “It’s a different type of living screen,” says Rodriguez of the planting wall that allows light to stream through while visually separating the space. 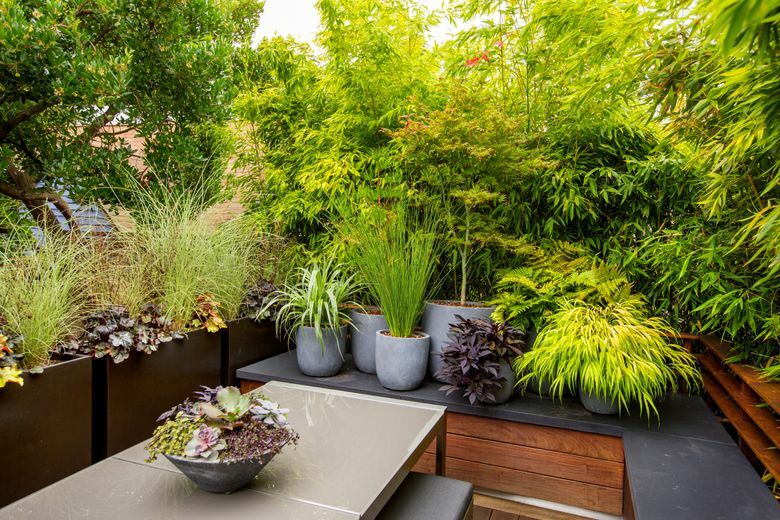 At the far end of the deck, past the dining table and chairs, is a horticultural display that Rodriguez calls “the cityscape.” A wide bench holds a cluster of sculptural urns planted in dark-leafed heuchera, compact grasses and a small-scale maple tree. These foliage plants need little attention, holding their color, shape and line through the seasons. Eckley put the narrow side gardens to work. On one side of the house, the path is thickly mulched in crunchy hazelnut shells, a rain barrel collects water off the roof and a potting table is fitted up against the house. The other side is a destination in and of itself: a minuscule and immaculate little Zen garden built around a huge old strawberry tree (Arbutus unedo) limbed up to reveal its mahogany-colored bark. 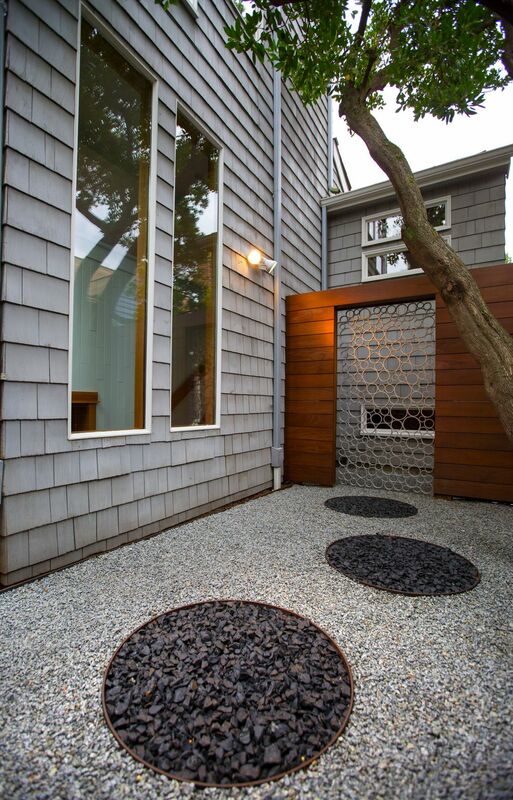 The space is floored in rings of dark gravel set into a mulch of pale gray gravel, all contained by rusty metal edging. The ring motif is repeated in a handsome aluminum gate set into a wooden fence. 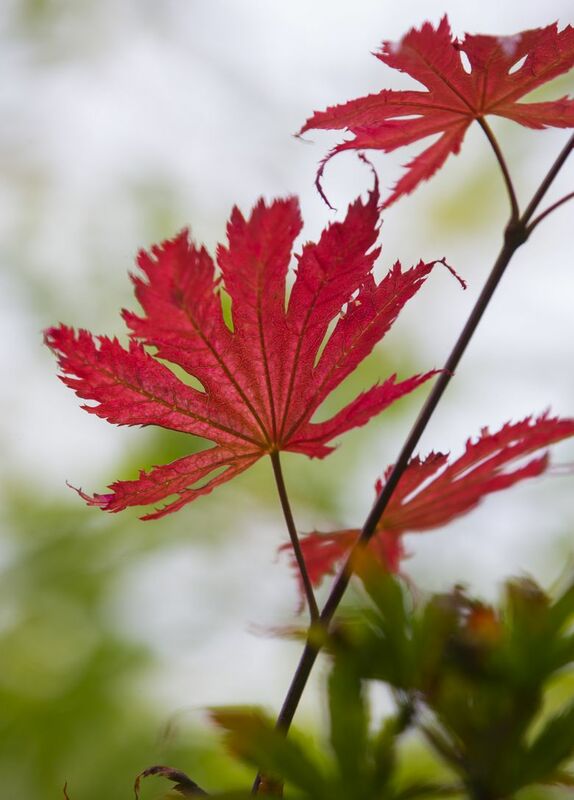 Rodriguez was actively involved in the planning process; she initially disagreed with Eckley about the Japanese maple in the pot, but has come to love it. “Working with Connie was a dream,” says Eckley, adding that every year, Rodriguez has cleaned and oiled the deck herself. 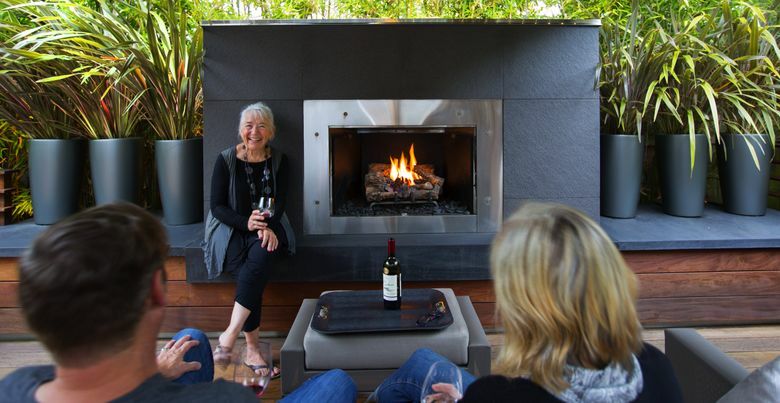 “The space looks great all year long because of the hardscape design. 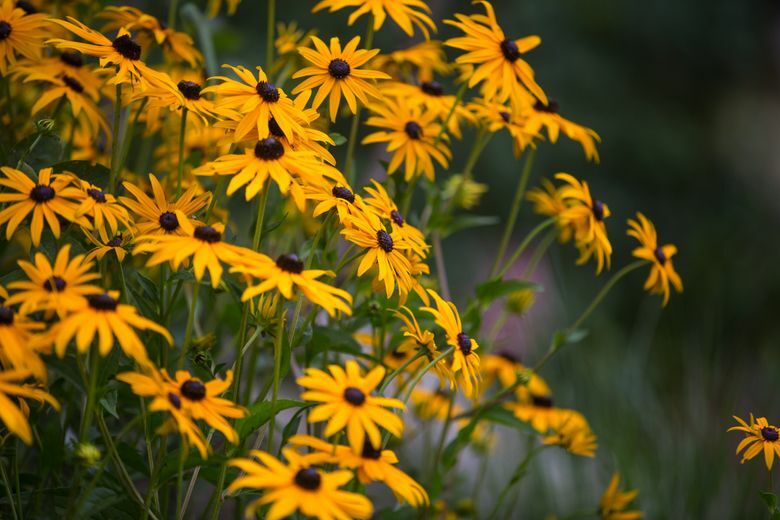 I love the quiet Zen feeling Scot created … and the garden is so easy. There’s no weeding,” says Rodriguez.